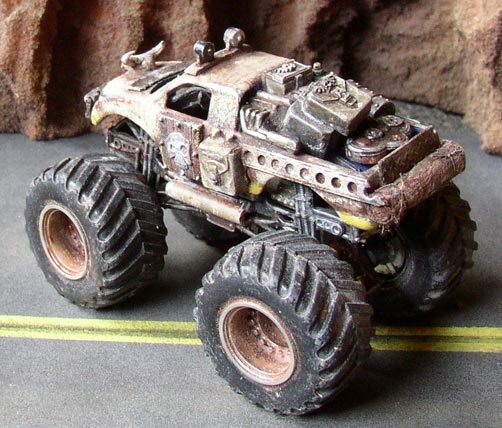 On this resource page are tips for collecting CARS, BIKES, TRUCKS, and MONSTERS for your ROAD WOLF games, and some ideas for ROADS for them to battle over! What better source for vehicles than Hot Wheels and Matchbox cars? At a dollar apiece, you can't go wrong! 1. Sand the body down to dull the paint and add scratch and chip marks to the edges of the vehicle. 2. Sand the wheels down! It gives them a lightened, matte finish that looks much more like real rubber than the original shiny plastic. 3. Give them a dark brown wash and a tan drybrush to grunge them up. Bonus points for rearward streaking- it can make them look faster if done right! 4. A silver sharpie is a quick way to pick out any details or edges to make them look chipped and worn. 5. 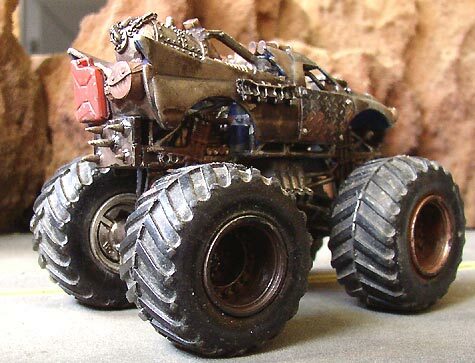 Add spoilers, blowers, bigger wheels, pipes, ram bars, fenders, wire mesh, gas cans, tarps, spikes, weapons, skulls, or anything else you like to turn them into true survivalist vehicles! You can make it easier to tell what's going on during a game by creating different teams, EACH with their own distinct colors and styles. Below are examples of Enforcers, with their infamous Interceptors, a Marauder gang, Rodders, Survivalists, and even local Police! Road Wolf is set in a dark time where criminals and savages have a death grip on the open road. Enforcers have arisen in response to the violent Road Gangs, using their own brand of brutal justice to keep order on the highway. Their black vehicles are as stark and brooding as the veterans within. 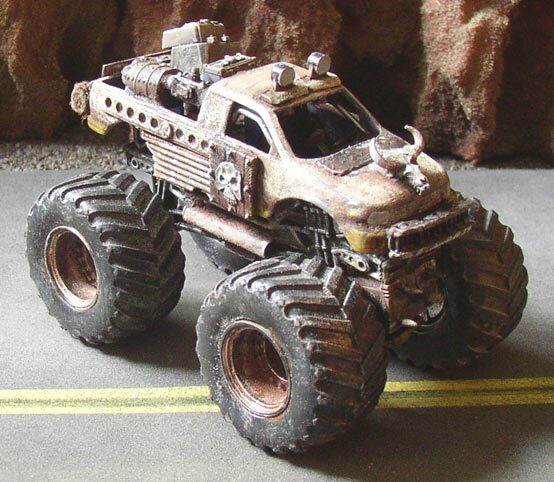 Enforcers prefer supercharged street vehicles for pursuing criminals, but they will also make use of military-style offroad vehicles to catch their prey, no matter where they go. 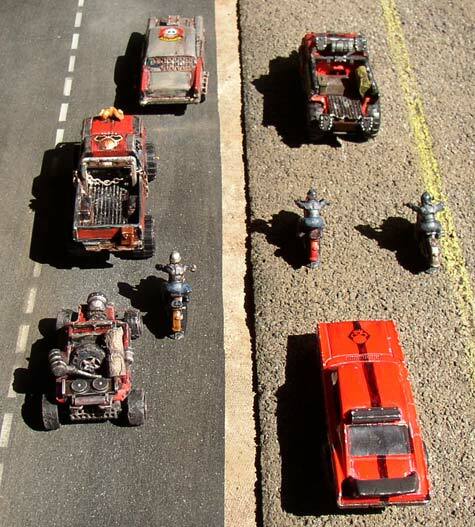 The buggy and the Humvee are Matchbox vehicles (from the Medieval Rides set). After being primed flat black, they got a brown wash, some silver sharpie paint chip marks, and a tan drybrushing to dull them down. 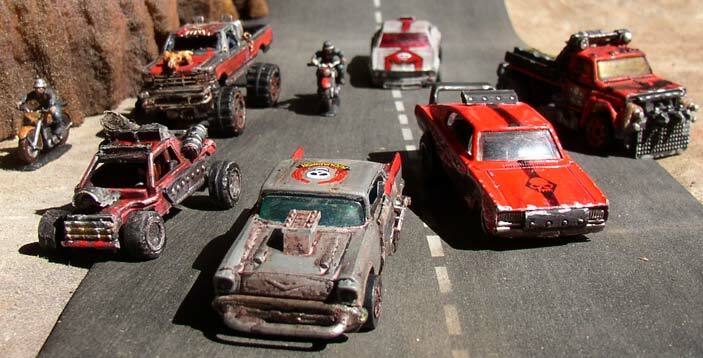 Behind them are two futuristic looking rally-style cars, made of Hot Wheels "Sting Rod II" vehicles with their missile launchers removed and a quick black paint job added on. 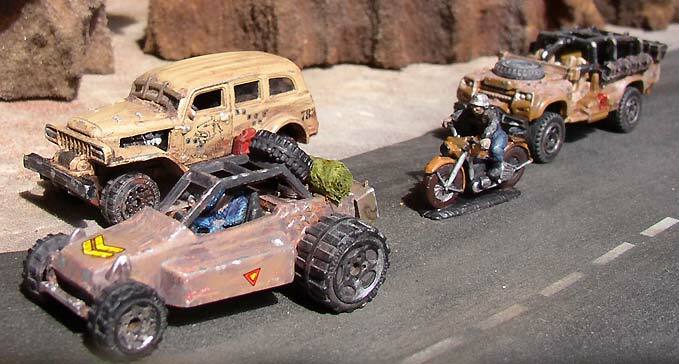 The interceptor in the back is a car a friend of mine made for the original Road Wolf game- over 20 years ago! I added a few more details, like the door panels and window grating. 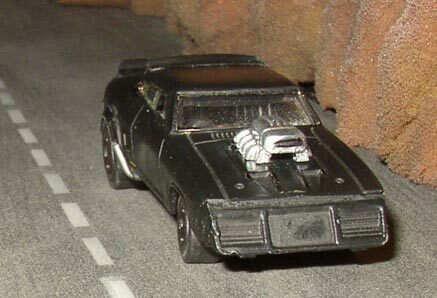 Leading the pack are my two latest interceptor conversions- more on those below. While looking for some good base cars to work with, I found some Hot Wheels Falcon XBs (in stores now! 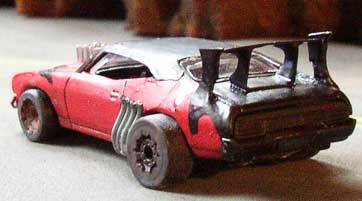 )- the base car for Mad Max's V8 Interceptor! I attempted my own conversion in tribute to the films that inspired Road Wolf. It's not perfect, but I feel it is a good likeness! Here's a shot of the conversion next to a stock model. The front end is completely different. I found a bumper on another car that had a nice wedge shape- not accurate, but it looks okay and saved me a lot of time. I had to use a moto-tool to GRIND the front end of the Falcon flat, so I could glue the bumper in place.The blower is also stolen from another car and is also not accurate at all, but it had nice clean detail so I cut it off, primed it silver, and didn't actually glue it on until after the rest of the car was painted. Another big change is the addition of roof and back spoilers. I had to grind away the original spoiler on the back since it was the wrong style. I used plastic from a Ziploc style plastic container lid, cut it to size, sanded it, and glued it on with plenty of CA glue and baking soda to fill the gaps. The pipes are made of steel wire- I cut four lengths, stuck them side by side on a piece of tape, added some glue, and closed the tape up, leaving a good amount protruding outside the tape. Then I used flat nose pliers to bend the four pipes up into shape, then glued the tape end under the car after filing a flat spot for them to stick to. I used the wheels from the original model even though they are the wrong style. They needed to come out a LOT more, so I cut them off, and remounted them on a slice of dowel to push them about 1/4 inch out from the body. They don't spin anymore, but you don't want your cars rolling away in the middle of a game anyway. The final and most annoying detail are the flared fenders- I only did the back ones 'cos they are annoying. I start with a Lego disc piece, sand it down on the flat side, and grind away the inside with a moto-tool until its only a sliver wide. Then I file the fender down just a bit so it's easier to glue on. Before painting, I sanded the whole thing lightly to help the paint stick, and sanded all the edges HEAVILY so the metal comes through. This way if your paint scrapes off, it just shows metal instead of the base color (a rather conspicuous yellow in this case).I put masking tape over the windows before priming the whole car flat black. Once the paint dries, you can BUFF it by rubbing it with your finger to get a slightly more glossy finish. 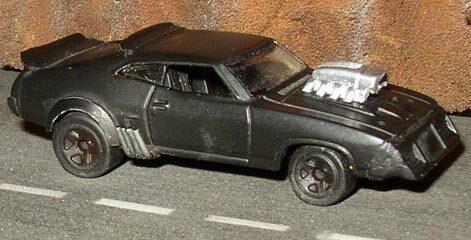 Eventually, I'll do a "Road Warrior" version, with the gas tanks in the back, more weathering, etc, but before that, I want to make a different Road Warrior vehicle- that badass black and red car with the bat on the hood. It was based on an XA, I believe, so it should be pretty easy to get the right look with another XB. 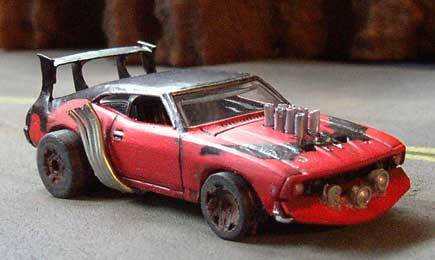 Other cars can make for nice interceptor conversions too! 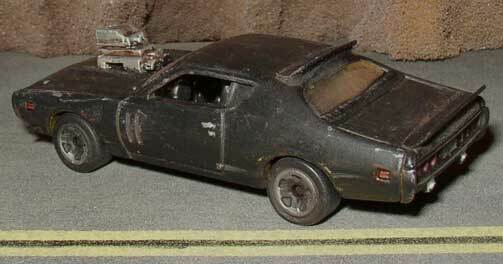 This Interceptor started out as a Hot Wheels '71 Dodge Charger. Once again, I made spoilers out of a plastic lid that my lunch meat came in (Ziploc makes similar ones). The Blower is made out of Storm Bolter parts from an old Games Workshop vehicle accessory sprue. I primed the vehicle flat black and added paint chip marks with a silver sharpie marker. Various brown washes and drybrushing give the car a weathered look. 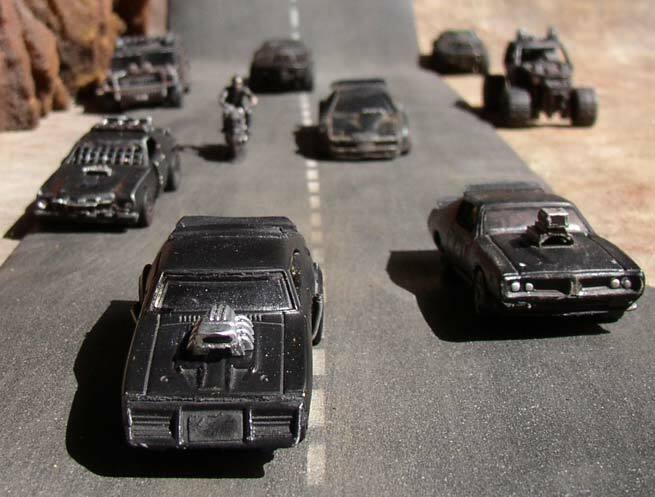 Renegades and marauders have turned to the power of vehicles to pursue their misguided aims. There are many road gangs out on the highways, and one of the most infamous gangs of brutal highwaymen are the Red Death. 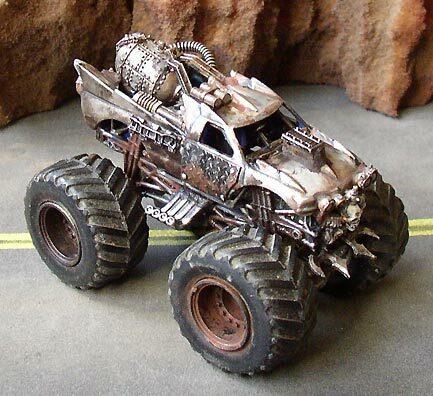 The Red Death favor overpowered vehicles with dangerous modifications. 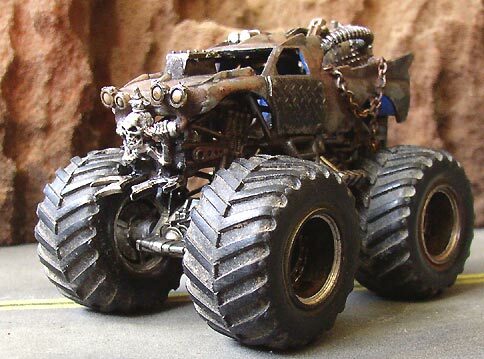 Ramming and melee are popular tactics for these brutal machines. The buggy is simply an interior from a race car with wheels, engine, and accessories added! The Chevy's front bumper is a piece of heavy wire inserted into drilled holes. The car is bare metal with red trim and a brown wash. The 4x4 is an old F-150 truck with its windows gutted out, an additional bumper added to the front, and some chain added to the back. The skull on the front is from a Warhammer Beastman skeleton! The original paint was stripped off with a moto-tool wire brush, then red stripes added. The orc skull on the roof is a Warhammer banner sticker. The '67 Charger is a converted Hot Wheels '67 Charger with replacement rear wheels. 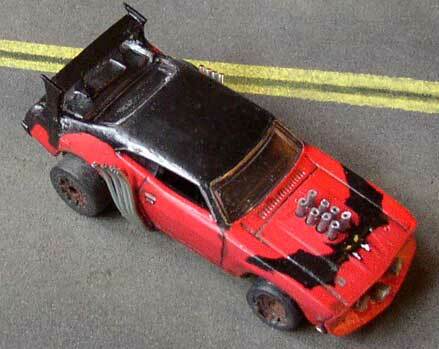 The front bumper and roof spoiler are small parts from an IMEX platformer kit. The rear spoiler is cut off of another vehicle. 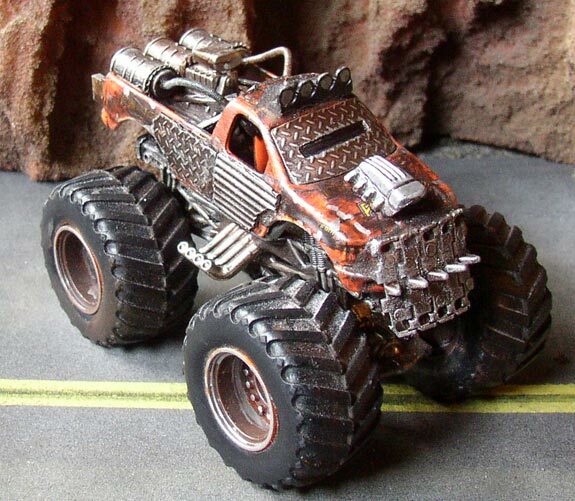 After painting over the "Hot Wheels" text on the side graphics, I added a skull decal from a Warhammer 40K Imperial Guard transfer sheet and used a black sharpie to add a racing stripe. The Grey car recieved a similar treatment, though the skull on the hood is a sticker from a Zoids toy this time, and a red split stripe was added on with a red sharpie. 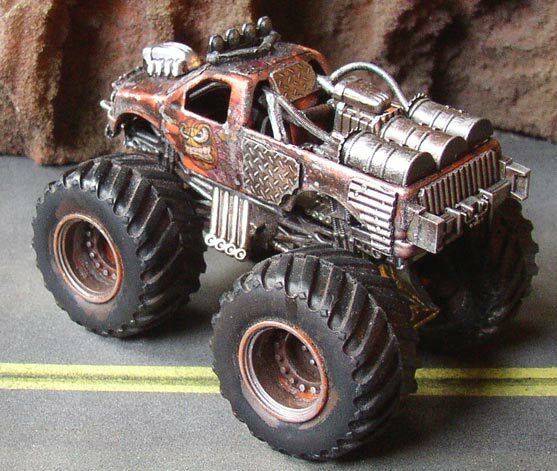 And finally, you may remember this awesome enemy car from Road Warrior. I certainly do! I started with a HW Falcon XB. The spoiler is scratch built from sheet lead and brass. I used sheet lead for the sides because it is soft, and easier to blend into the body. To get the basic shapes, I used a hole punch, then filed things clean with a half round needle file. I also made the front airdam out of sheet lead, and added spotlights from a model kit. The hood pipes are wire ties with the wire removed (basically clear tubing). After drilling holes in the hood, I stuck the tubing onto a push pin, colored them with a silver sharpie, then added superglue and plugged them into the holes. They were a pain. The side pipes are steel wire, glued into a bundle, then bent into shape and glued onto the bottom of the car. I used a moto-tool to grind out the fenders. Then I added on some filed down wheels for the duallies in back. 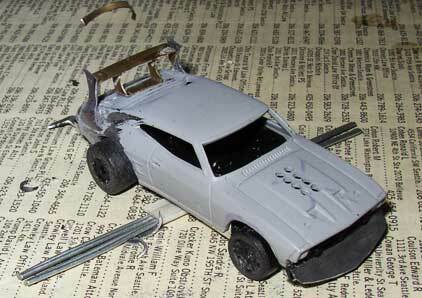 Because the car I started with was yellow, I ground the paint off with a moto-tool wire brush and then primed with grey. So the red and black are all hand painted. Enforcers and Renegades aren't the only ones out on the roads. Rodders are often grizzled old mechanics who take great pride in their rides, and they'll take the law into their own hands if necessary. Rodders ride to live and live to ride, preferring powerful classic vehicles to the sinister machines of the Enforcers or the brutal creations of the Red Death. Many a crazed marauder has mistaken a pack of Rodders for defenseless civilians, and paid for it with their lives. All of these vehicles are stock models! Some have been repainted orange though, to match the rest of the vehicles. In these dark times, there are many who believe the end of the world is not far away. 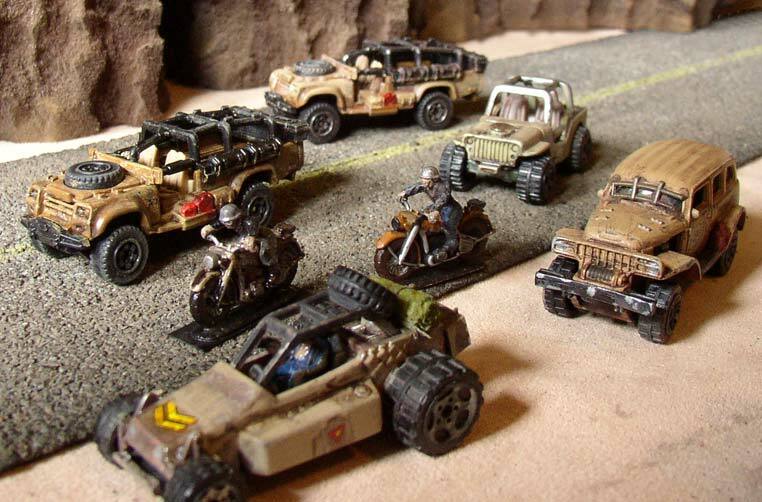 Survivalists have retreated from the decaying cities into the lawless badlands, and have created a fleet of vehicles tough enough to survive the apocalypse. The buggy in the foreground is a converted sprint car. 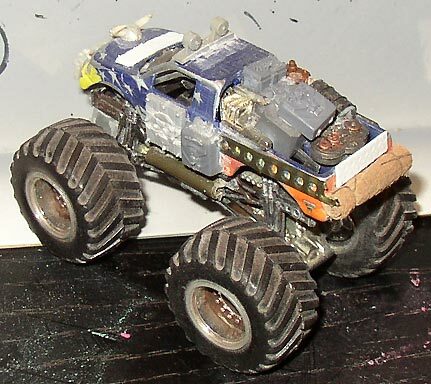 It has offroad wheels from another vehicle, a tarp made of rolled up tissue paper, and a spare tire for that offroad look. The driver is a repainted micromachines Greedo figure! The truck behind it is from the Matchbox Medieval Rides set. A window grate has been added, but otherwise this vehicle is stock, with just a bit of weathering (dark brown wash and silver sharpie chip marks). The open trucks in the back are Matchbox Sahara Survivors- totally stock models, with just a bit of paint to grunge them up. The Jeep in the middle was a crazy hot rod that I stripped back down to just the Jeep body, since it was a good size. Most jeeps are way too big to be in scale with other cars. This earlier shot of the vehicles shows how tricky painting can be. The original Tan I used on the buggy and Sahara Survivor was way too pink. I mixed some white and yellow into the paint to get the better colors for them seen in the picture above. Although the Enforcers are known and feared throughout the land, they can't be everywhere at once. Many of the older districts still employ their own local justice, who do whatever it takes to keep their trusty old coupes and interceptors up and running. 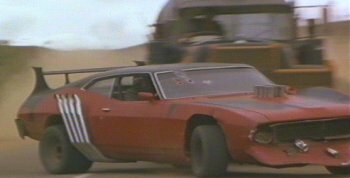 The two Muscle Cop Cars are HW '69 Ford Torino Talledegas. They came that color! A scoop was added to the hood, a spoiler to the back (painted black, made from a plastic razor cover), the rear wheels were replaced, (with Lego ones), and light bars were made by cutting the ends off of Light Bright pegs. I couldn't find any red pegs, so I used orange ones and colored them with a red sharpie. They were mounted onto strips of sheet lead glued to the roof. The other two cars were also stock, and just got a light bar added, no other modifications. The Vega had a blue stripe I blacked in with a fine point sharpie, and the Duster came already hoodless and blown- I just blacked in the engine compartment with some flat black enamel. 1. Old Micro Machines motorcycles. You have to go to ebay or collector stores to find these, they stopped making them years ago. I based up mine by gluing it to a brass plate, so it doesn't fall over. 2. 1/72 scale military models. Armourfast makes a set that is reasonably priced and perfectly scaled (more on that below). Here's a nice collection of bikes for our games. The bike in the center is a Micro Machines motorcycle. 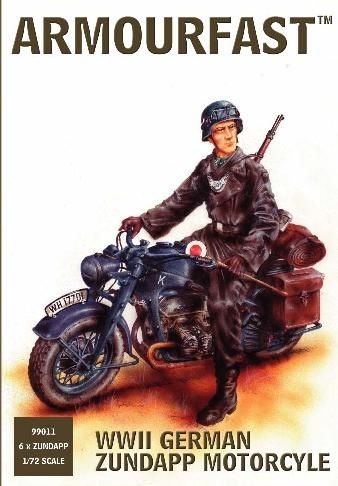 The other four are 1/72 scale Armourfast german motorcycles! I also used a spare rider from the Armourfast kit to equip the Micro Machines bike with a rider, and it fit perfect! Pictured below is the set I purchased, for only $8 including shipping. It comes with 6 bikes, riders, and extra figures! The only problem is the plastic is very rubbery (so it doesn't snap), which means you really need to clean it with soap and water, and use some strong superglue to keep them together. To paint them, I primed using a metallic paint since the laquer base will actually dry over rubbery plastic, then I hit 'em again with flat black enamel primer and paint them with enamels. 1. Matchbox's SUPER CONVOY series of trucks. They're only 8-10 dollars. The truck below started as one. 2. FastLane makes some decently sized trucks too, usually for around 10 dollars. 3. There are promotional trucks made for John Deere, beer companies, etc. that are a good size, though they tend to cost more (12-18 dollars). Here's my first Truck conversion. Starting with a Super Convoy truck, I sanded it down and built a push bar for the front. I made a visor out of some sheet lead, and a horn out of some plastic and wire bits. The hood and fenders were very rounded, so to make them more menacing, I added a strip of sheet lead over the front of the hood to make it more square, and some small lights on top of the fenders. The trailer was too tall, so I cut it down and drilled some holes along the top edges for more detail. 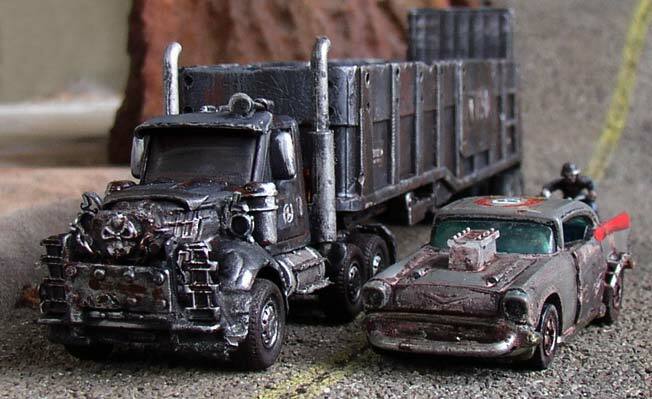 The whole truck was distressed with a moto-tool, primed flat black, drybrushed grey, and then detailed with silver sharpie and some brown washes. The trailer is actually big enough to hold two cars! I remounted the trailer back door with a hinge at the bottom so it could form a ramp for the cars to enter and exit. Also note the textured plastic added to the floor of the trailer to give it more detail. 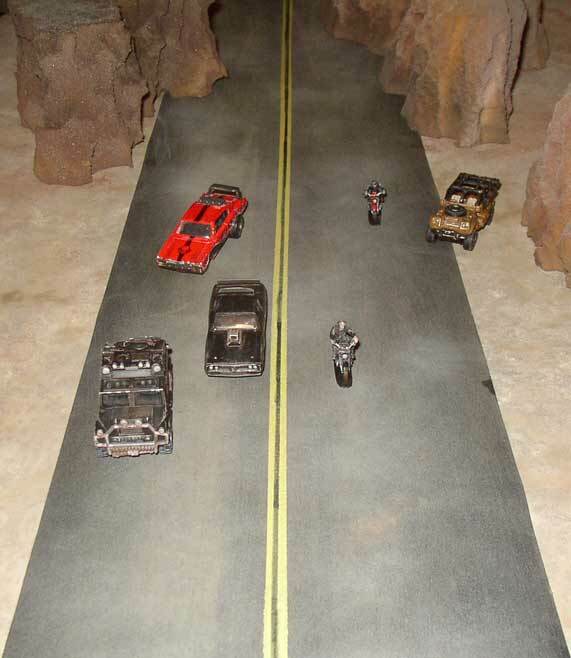 One of the special scenarios for Road Wolf pits cars against Monster Trucks. 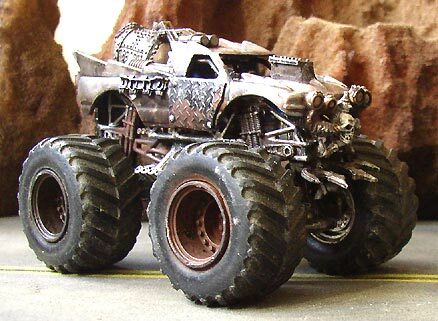 Using off-the-shelf monster trucks works fine, but they are even more fun to convert than regular vehicles! I call this one The Beast (which could double as a Red Death vehicle in a pinch). 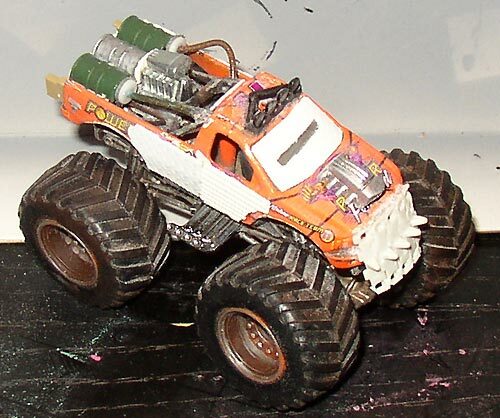 This started as a Shocker monster truck. I destroyed a moto-tool wire brush stripping all the paint off. Then I set to gluing on all manner of crap. 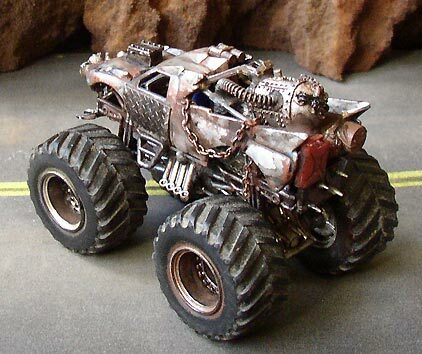 The big fuel tank in the back is from an old Ork Skorcher model. Its lead, so it was easy to cut and bend into place. Tank parts and toy hoses complete the details in the bed. This one uses plastic fuel tank parts, tank tread, metal spring bracelets, spare engine, roof lights, blower, and pipes from scrapped Hot Wheels cars, and textured styrene plasticard for the side and window armor. A rectangular hole punch came in handy for the window slit. 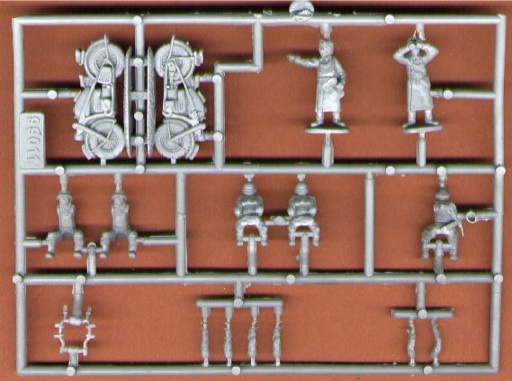 This one uses various toy and model parts, including pouches from a GW Ravenwing Bike sprue, Goblin shields for the door armor, and a metal wolf skull with horns from an old skeleton sprue. The bedroll in back is rolled up tissue paper tied with thread and coated with some glue. The Tires are extra distressed with sandpaper. 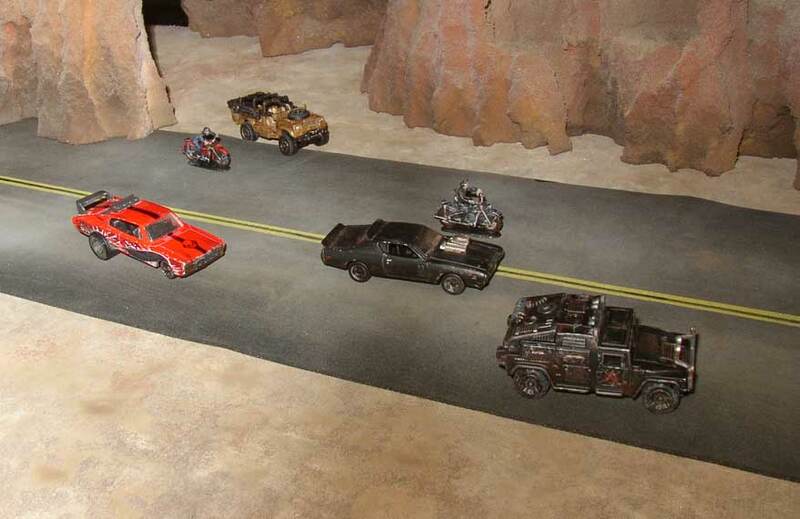 Aside from vehicles, the main thing you need to play Road Wolf is a road, of course! Actually, two parts: a dirt "off-road" and a paved road. Your dirt off-road should be 2' x 4', and the paved road should be 4' long and 6 to 8" wide. Pictured here is my 8" wide road, made from a thin foam liner meant for use inside toolboxes or on shelves. I bought a 4 foot long roll that was 18" wide, and cut it into strips of road with a sharp hobby knife and a long steel ruler. Then I sanded the road surface with sandpaper to lighten it, rough it up, dull it down. By sanding along the length of the road you can add some streaks that help convey a sense of speed. Then I used a dusting of flat white spray primer, very sparingly, to lighten it some more. To paint the double yellow lines, I masked off a strip in the center and spraypainted it yellow, then using a black sharpie and a straight edge, I inked in a black line to make the strip into two stripes. Finally, to give it some color and dull it down even further, I RUBBED IT IN THE DIRT! Yep, using some dry, sandy, dusty dirt from the back yard, I got a very convincing finish on the road. The off-road is a piece of heavy upholstery cloth. I started with a dark brown color, and used white spraypaint to lighten it up a bit. I then used shredded foam rubber sponges to paint on various shades of brown, tan and grey in blotchy patterns. Then I rubbed the whole cloth in the DIRT! The dirt roughs up the cloth surface just a bit to add some texture. It also adds some color, evens out the painting, lightens it up, and dulls down any shiny bits for a more natural finish. Dirt for the win! On the left is a shot of the Road material and the Off-road cloth material from underneath- you can see that although thin, these materials are just heavy enough to stay put during our games. You can also see just how much they were lightened up with sanding, paints, and dirt rubs! A cheap alternative to foam rubber is ASPHALT ROOF TILE. You might have some on your roof right now! The middle picture shows the back of an asphalt tile- avoid getting the black tar strip hot or it will become very sticky. Roof tiles are usually 3 feet long, with three "shingle" tabs sticking out - to make them into road sections, just cut these off with a heavy duty knife or some old scissors. 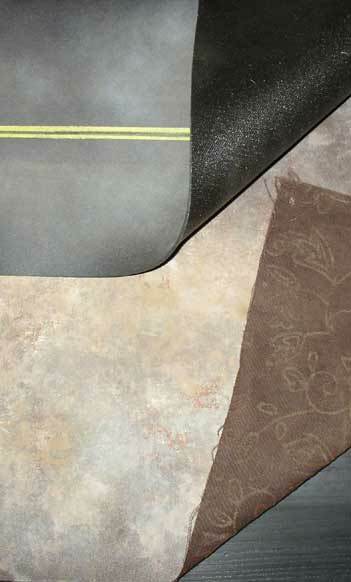 Try to get black tiles (if they are grey or taupe, you can spraypaint them with flat black first). Then rub them down with some dirt to give them a warmer, lighter color. 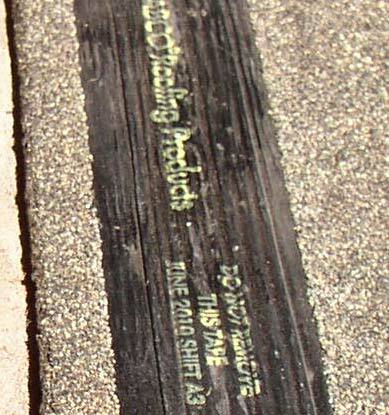 The last picture shows the foam rubber road on the left, and some asphalt tile on the right that has been dirt rubbed and had yellow stripes spraypainted on. It looks pretty good! However, asphalt tile is brittle, so it can't be rolled up like the foam rubber can.